The combination of stylish elegance and contemporary style have produced an outstanding villa. Superb views across the garden and pool to the Mediterranean. Located in a gated beachside villa area with 24h security. An extensive hall welcomes you to this charming villa with ample interior spaces. Symmetrical spaces such as the stairway from the vestibule and a deep projection from the hall towards the garden, offer a geometric and harmonious result. Open plan living and dinning room, modern fully fitted kitchen with breakfast corner and guest room en suite all leading to a large covered terrace. On the first floor you find the master bedroom ensuite oriented to the south with spectacular views of the swimming pool, gardens and the sea. A space full of autonomy and privacy with a cosy salon, large 2 walk-in wardrobes and its private terrace. All in the use of light, colour, balance and shapes allow this space to become glamorous, cosy and comfortable all at the same time. On the lower level, there space for a gym with spa area, entertainment room with bar and a further 2 guest bedrooms and full bathroom. The solarium has a Jacuzzi and wooden built-in sun loungers with enough space for a large sitting area with open views. 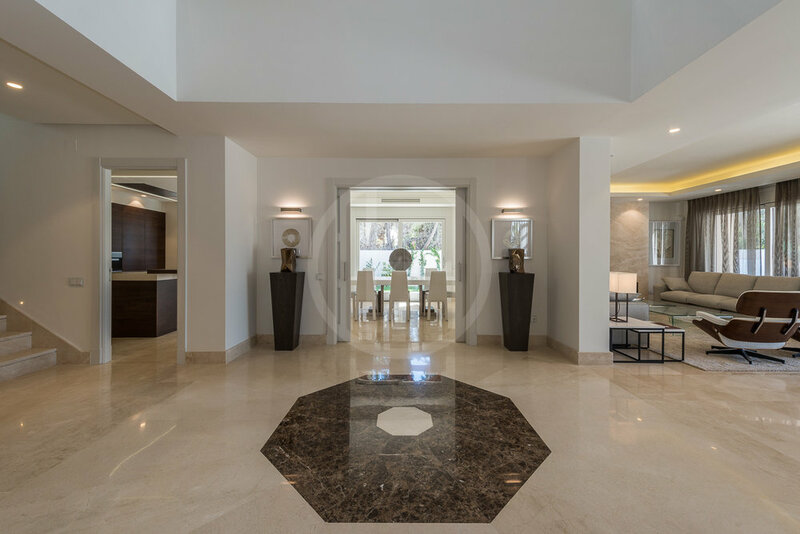 Set on the Golden Mile, the property has walking distance to both the iconic Marbella Club and Puente Romano hotels with all their excellent services, restaurants, tennis club and SPA. Just a short stroll down to one of Costa del Sol´s best beaches too.